You need your sleep. Without quality shut-eye every day seems to drag on without end. Even with the best mattress, cool, clean sheets, and an ergonomically designed pillow, if loud sounds abound you can bet that you’re going to be up all night frustrated, agitated and downright mad. There are an infinite number of noises that can snap you out of a dream-filled slumber. Perhaps the city has decided to make some “improvements” to the street outside your window by enlisting a construction crew to jackhammer away at 6:00 am every morning. Or maybe your significant other’s snoring sounds like a buzz saw attempting to cut through sheetrock. Luckily there’s an antidote for obnoxious sleep-shattering sounds: the handy-dandy earplug. 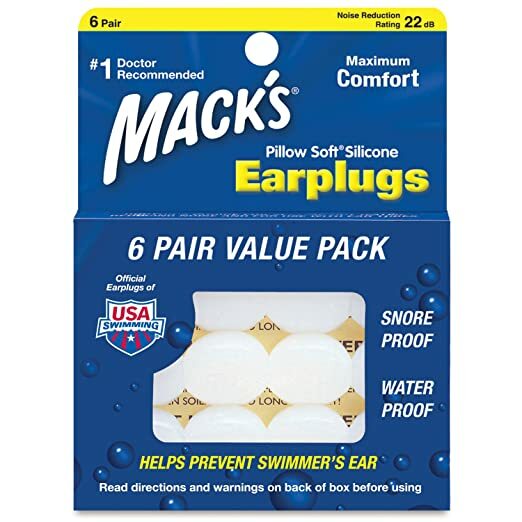 Below are the top 8 best earplugs for sleeping 2019. No doubt one of these options will help you get back to sleep no matter what loud noises rage outside. This #1 doctor recommended brand has created the softest, cushiest earplugs out there. 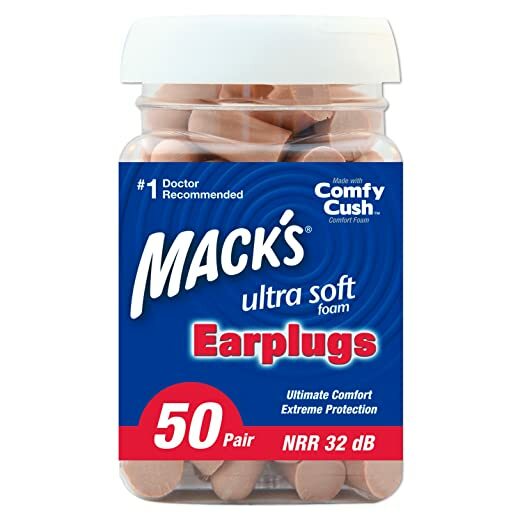 Ergonomically designed for maximum comfort, Mack’s Ear Care Ultra Soft Foam Tan Earplugs are modest in color and in price. Coming in packs of fifty, you can reuse each pair of earplugs a few times before replacing them. One bucket of these earplugs should get you through several months. The super soft foam material condenses down for easy insertion into the ear canal. Not too long and not too short, these earplugs should fit the length of most ear canals, though some users with narrow ear canals may find these plugs a little too large for them. Another homerun from Mack’s, these Pillow Soft Silicone Earplugs allow you to block out noise without inserting anything into your ear canal. The moldable silicone material fits snugly in your ear night after night. Simply remold with every use until the fit is perfect. As long as you take care of these earplugs by wiping them down to rid them of any earwax buildup, each pair should last you for a couple weeks. Once they start to lose their pliability, toss them and grab another pair from the pack of six. 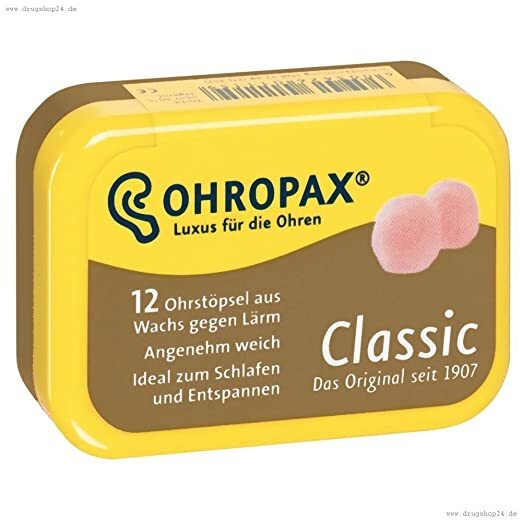 Containing no known allergens, the Ohropax Wax Earplugs are great if you have any skin sensitivity. Like the Mack’s silicone earplugs, these wax plugs mold to fit the ear without entering the ear canal. These plugs cause no pressure inside the ear and are very comfortable to wear. Easy to knead and shape, these earplugs have a Noise Reduction Rating of 27, so they will be powerful enough to block all but the loudest of noises. Biodegradable and eco-friendly, you can feel good about using these earplugs. 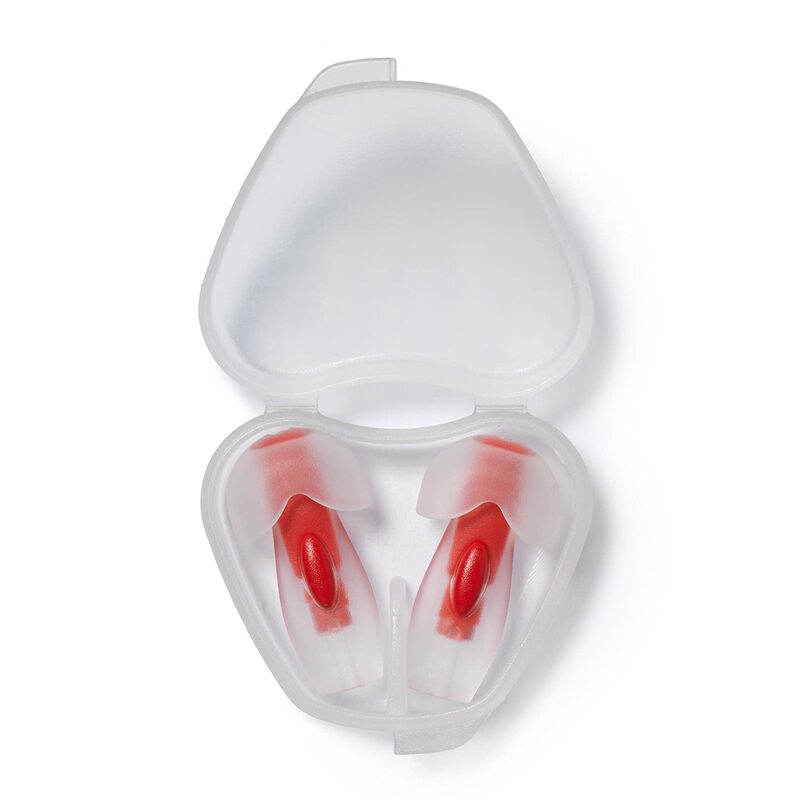 No matter what your ear size, the Ohropax earplugs will get you through the night with ease. 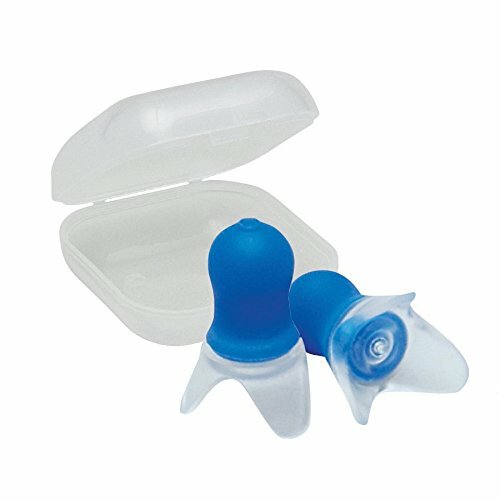 These short foam ear plugs are great for people who like to curl up on their side to sleep. While people with long ear canals may not like the fit, most will find that the Super Sleep Comfort Foam Earplugs set them up right for some good shut-eye. Easy to insert, these plugs can be used night after night without losing their softness or shape. Providing a near-perfect fit, the Super Sleep earplugs will keep out noise up to 29 decibels. These neon plugs are loud, proud and designed to fit the ear without causing undue pressure. Though some may not enjoy sleeping with the cord behind their neck, rest assured that if you choose these earplugs you won’t have to deal with losing them among your sheets if they fall out during the night. Great for traveling as well as sleeping, the Howard Leight by Honeywell Laser Light Corded Foam Earplugs have a T-shaped design that fits all ear canals comfortably. With a noise reduction rate of 32 decibels, these earplugs do a bang-up job of blocking noises of all kinds while you sleep. 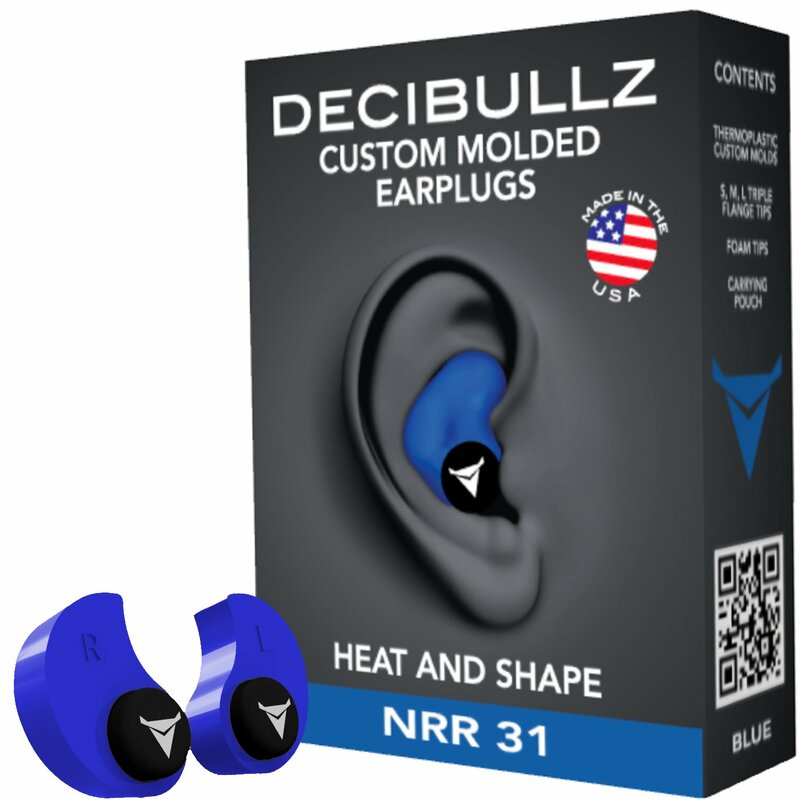 For those who like a custom fit, try the Decibullz Custom Molded Earplugs. All it takes is a quick boil-and-mold process to have a custom set of earplugs guaranteed to help you sleep through the night for months without needing to replace them. If you don’t get the earplugs the way you want the first time you can repeat the process to find the perfect fit. With a patented triple seal, these earplugs come with several sizes of flanged tips to insert into the ear canal for additional noise blocking. Several fun colors are available to choose from and the plugs come with the optional addition of foam tips for easy insertion and removal. Maybe you want to dull the noise at night without completely removing it. If so, the Happy ears Reusable Natural Sound Earplugs are for you. Great for blocking some sound while still leaving you alert to emergency noises or alarms, these silicone plugs are easy to use and hypoallergenic. The medium size fits most ear canals, but there are multiple size options available to serve all sizes. Protecting from noise up to 26 decibels, these earplugs are the perfect middle ground sound blocking option. 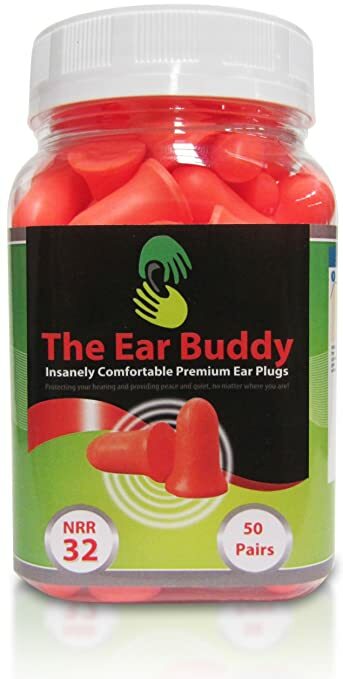 If you’re dealing with a serious snorer, a wicked-loud thunderstorm or even the incessant bark of your neighbor’s dog, these earplugs will get you through. The Ear Buddy Premium Soft Foam Earplugs are designed to protect you from even the noisiest of noises. They have a Noise Reduction Rating of 32, which is not uncommon among earplugs. What sets these apart from other 32 NRR options is the fit. High quality, non-abrasive polyurethane foam fits snugly but comfortably in the ear canal, sealing you off from obtrusive sounds. As the fit is nice and tight, you don’t have to worry about these falling out in the middle of the night. While your ears may be firmly plugged, you won’t have to deal with any discomfort due to pressure, even while sleeping on your side. You may sleep through your alarm. Seriously. Any of these earplugs will get the job done, but which one is right for you? For the best night’s sleep possible, consider the following variables before buying your earplugs. Earplugs come in a variety of materials, each one with its own pros and cons. You may want to try a pair in multiple materials in order to see what suits you best. The most widely used material for earplugs, these little cushy plugs roll up and compress in order to be inserted into the ear canal and then expand for a snug fit. Silicone plugs have the benefit of being easier to clean than foam plugs. Some silicone plugs are moldable and others are flanged and stiff. The moldable plugs conform to your individual ear shape and provide a snug fit. Wax plugs are the rarest on the list. Softer than their silicone counterparts, these highly pliable plugs are usually eco-friendly and very comfortable. They may, however, be more expensive than their foam or silicone counterparts. It’s hard to inspect the size of your own ear canal, but it’s important to consider when buying earplugs. You’ll know as soon as you try a pair whether they’re too long, too short or just right. Earplugs should be comfortable. That’s the key. If you’re feeling the tip of the earplug in your ear take it as a sign that you need a shorter pair. On the other hand, plugs that are too short will likely fall out. A little trial and error here is the best method to finding your perfect fit. This really only applies to foam plugs. Bell shaped, T-shape, cylindrical…there are many options and no choice is inherently better than the other. It all comes down to fit, so don’t be sold based on shape alone. You won’t know if they’re right until they’re in your ear. This is a big one. The Noise Reduction Rating (NRR) lets you know how much noise you can expect to block with your plugs. Some of the plugs on this list have a rating as low as 22 or as high as 32. If you’re living with a loud snorer, go for a higher NRR. However, if you still need to be able to hear important sounds during the night, a slightly lower NRR will serve you. One size does not fit all with earplugs. It may be a good call to get a couple pairs with different NRRs. That way you can tailor your noise reduction to your needs. If a pack of earplugs is labeled as single use, then it’s single use. Many users try to squeeze several nights out of single use plugs, and while that may be penny conscious, it can be very dollar poor if it results in ear infections, impaction or other painful repercussions. There are plenty of reusable options out there, and while they may seem more expensive up front, with proper care they will pay for themselves in the long run. Another factor in the reusable versus single use game is whether or not you are prone to losing your earplugs. No sense in investing in a nice reusable pair if they’re just going to get lost after a night or two. Most reusable earplugs come with a plastic container or traveling case to help you keep track of them but if you feel like they’re going to disappear anyway, perhaps snagging a handful of single use plugs is the way to go. With proper use and the right fit, sleeping with earplugs is no problem. However, there are a few precautions to take when choosing to sleep with earplugs to ensure that they remain a help and not a hindrance. Be aware of the following potential pitfalls of consistent earplug use and take the necessary steps to make sure you stay healthy, happy and well-rested. Properly cleaning your earplugs daily will help ensure that you do not end up with an ear infection. Dirty earplugs are contaminated with bacteria that can wreak havoc on the ears. Many earplugs are only mean to be used once and then disposed of. If your earplugs are reusable, keep them fresh by cleaning them with warm water and a hand towel. Foam earplugs are especially susceptible to bacteria build up, so if they’re not listed as reusable, toss them out after a night. Earwax (or cerumen) needs to drain daily in order to properly protect the eardrum and surrounding sensitive skin and tissue. Wearing earplugs, especially those that are too tight or improperly inserted, may cause earwax to build up rather than to drain out. To minimize risk of ear impaction, make sure that the earplugs are not inserted too deep in that ear canal. If you’re feeling any pressure or pain in the ear canal it’s a sign that you need to adjust the fit of the plugs. In addition, clean your ears regularly to avoid wax buildup. Investing in a good pair of earplugs means a better night’s sleep but could also block you from being able to hear important noises. If you want to make sure you can still hear your newborn infant during the night, your alarm the next morning and any sounds that may indicate danger to you and your family, go for a pair with a lower NRR rating. A lower NRR rating doesn’t mean poor noise reduction. It may just mean the difference between hearing an important sound and sleeping right on through it. If you are experiencing pain at any point while using earplugs, they’re not the earplugs for you. 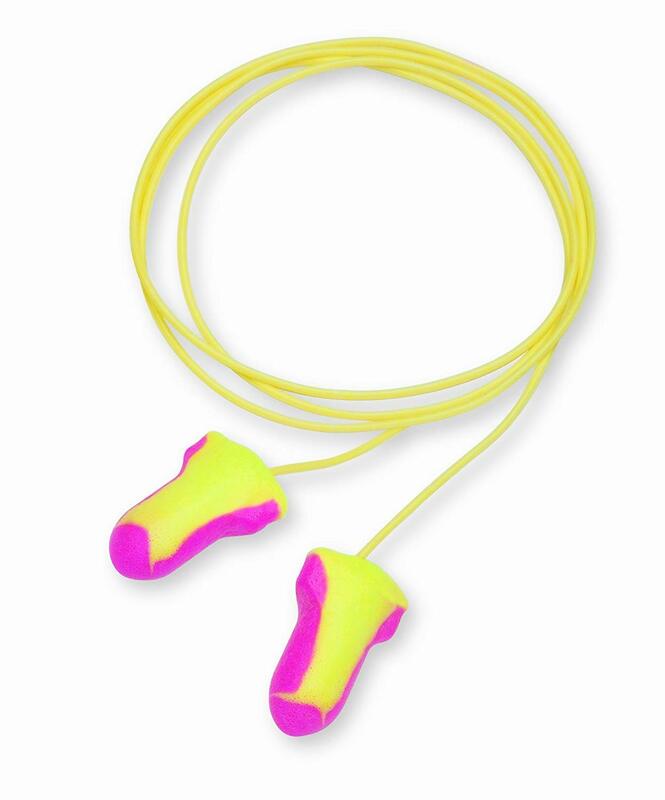 Earplugs come in all shapes and sizes, so don’t settle for something that leaves you with sore ears the next morning. Tinnitus (constant ringing in the ears) can also arise from regular earplugs use but can be avoided with properly fitted plugs. Foam plugs that are inserted directly into the ear canal are more associated with ear pain than wax or silicone moldable plugs. However, as the moldable plugs fit in the entire ear opening, they do run the risk of creating pressure in the ear canal. To be safe, leave a little space in the ear rather than blocking it completely so a small amount of air can still flow through. Earplugs are a must for those struggling to get a decent night’s sleep due to surrounding noise. It’s important to find the right fit, the right material and the proper NRR for your needs. This may mean trying a few pairs out to find the perfect match. Don’t settle for anything less than an uninterrupted blissful slumber. Grab yourself a pair of earplugs off this list and get ready to float off to dreamland. You’ll thank yourself in the morning.